The first FocOz ® camera will be sold in a kit including the camera itself and a software package for processing the images acquired by the FocOz camera. 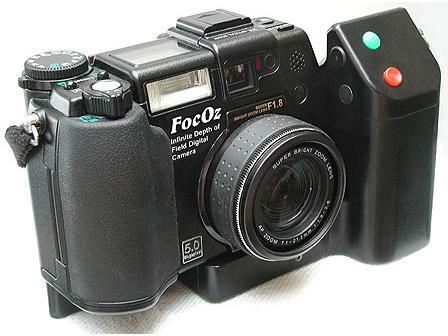 The FocOz camera has a 5 Megapixel sensor and is capable of taking several differently focused images in a sequence. The focus settings will be selected by the photographer. The images in the sequence will be downloaded to the computer using a USB interface. 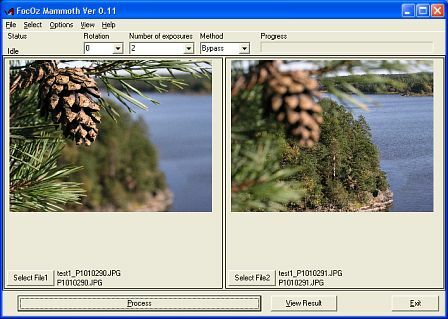 Using the FocOz software, the photographer can select images and sequences that will be merged into a resultant image with infinite depth of field (1). Please read the section What is FocOz to learn more about how the camera and software system work. The software package is easy to use and runs on high end computers with up-to-date versions of the Windows operating system. After you have installed the software, start it. The "Start Helper" pops up and you can press the "New Project" button and select a name for your project. A "project" is a set of images and the necessary information required to make a FocOz image. A project file is created to store the image information and other settings you choose. After selecting a project name you must select the differently focused images. This is done using a standard open image dialog window. To process the image set and create a FocOz image, press the "Process" button. Depending on the performance of your PC, this will take some minutes. A similar FocOz resultant image as processed in the example above, is shown in the download section of this website. The software will work on Windows 2000 Professional and XP. (4)(5). It might work on Windows NT, but this is neither tested nor supported. The software will not work on Windows 95, 98 and 3.1X. The FocOz software uses advanced copy protection technology, including state-of-the-art hardware keys, to avoid software piracy. Read more on FocOz applications here. FocOz® is a registered trademark of Sven-�ke Afsenius. (1) Infinite depth of field: By this we here mean the full range interval from the horizon down to minimum focusing distance of the lens. (2) Registered trademarks of Intel and AMD. (3) CD-ROM players, tape streamers, external disks that are connected to the parallel port might interfere with printer port operation making it impossible to get the hardware key to work. (4) Registered trademarks of Microsoft Corp.
(5)We would recommend Windows XP Professional over the Windows XP Home Edition. Scandinavian Nightvision AB reserves the right to change specifications on the products without prior notice.